Cake Wrecks - Home - Five Years, Baby!! Five years ago today I started a goofy little cake blog, just for fun. I never intended for anyone other than a few close friends to read it, and I was terrified the first time a stranger found it and commented. Within two months, though, my goofy little cake blog went viral, garnering about 50,000 visitors in a single day. It's been a wild ride since then. I realized my life-long dream of becoming a published author not once, but twice, and Cake Wrecks even landed on the New York Times Best Sellers List. John and I got to travel across the U.S. and Canada meeting thousands of you readers, sampling dozens of your bakeries, and only almost-dying that one time. I was invited on more TV shows than I can remember, including David Letterman, Rachael Ray, and I think even Martha Stewart - and one of my proudest achievements in life is that I turned them all down. I've also turned away TV producers, web content "gurus," and website conglomerates offering a pretty penny to purchase Cake Wrecks and turn it into something else - something less personal, something not ours. 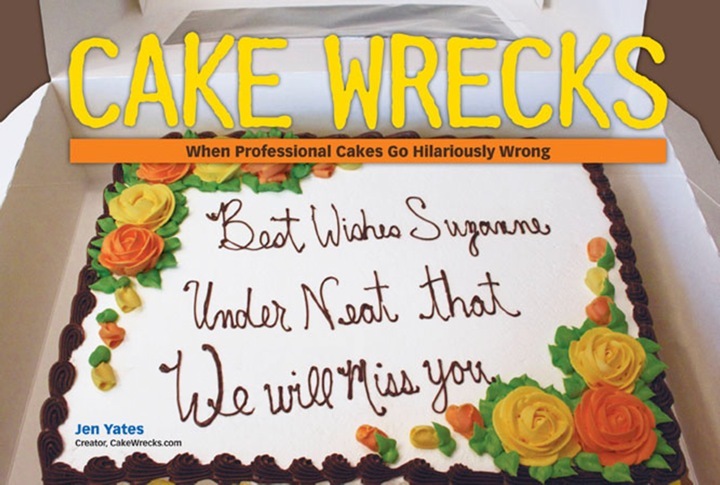 Cake Wrecks has been a labor of love from the beginning, and I've fought - and will fight - to always keep it that way. It's not a vehicle to make me famous, or a stepping stone to get me to where I *really* want to be in my career, because I'm already here. True, it has become my job - John's, too - and like every job it causes heartache and frustration and burnout sometimes. But at the end of the day, I get to check my e-mail, find a cake that makes me giggle, and share it with all of you. That's pretty frickin' awesome. Five years ago I never would have dreamed my goofy little cake blog would last this long, or that it would amass such a devoted readership. I mean, this blog was supposed to fizzle out four and a half years ago, and yet here you all are! I always told John I'd quit when the readers left, but it turns out you guys are more stubbornly loyal than I anticipated. Curse you. So here's to us, my dear wreckies, five years, 1,800+ posts, and roughly 8,000 cakes later. And if all that doesn't deserve cake, then I don't know what does. Oh, and I have to give a million thanks to John for getting me through these past five years - and also for not dying that one time - as well as to Lindsey, who writes more than half of our Sweets posts these days, and to Sharyn, who helps me write to the wrecks. You guys are awesome, and get a lifetime pass for extra sprinkles. I think I speak for all of us when I say how glad I am you HAD NO IDEA what you were getting yourself into 5 years ago. Happy Anniversary! Long may you wreck! Happy 5th blogiversary! Keep the wrecks coming! it is hard to even fathom that many wrecked cakes! You would think they would try to avoid being on your blog and improve! Happy 5 years!! I love this blog, so much. It makes me smile every day. Thank you to the whole Cake Wrecks team for all the hard work that goes into making this site what it is. May 20, 2013 | Amelia P.
Congratulations for five years! I love you guys. Keep up the great work. I couldn't get through a work day without you. 5 years already! congratulations and best wishes for the next 5! On its first annivers’ry Cake Wrecks gave to me a truly messed up Christmas tree. On its second annivers’ry Cake Wrecks gave to me a photo of EPCOT and a truly messed up Christmas tree. On its third annivers’ry Cake Wrecks gave to me a penile space shuttle, a photo of EPCPOT and a truly messed up Christmas tree. On its fourth annivers’ry Cake Wrecks gave to me, an awesome cake depicting Cinderella controlling a T Rex while her hair, dress and makeup remained perfect, a penile space shuttle, a photo of EPCOT and a truly messed up Christmas tree. I don't remember how or when I found you guys, but I'm so glad I did. I hope you've gotten as much pleasure from writing as I have from reading. Congraduations! On its fifth annivers’ry Cake Wrecks gave to me five years of laughs, an awesome cake depicting Cinderella controlling a T Rex while her hair, dress and makeup remained perfect, a penile space shuttle, a photo of EPCOT and a truly messed up Christmas tree. Congratulations. I want to thank you for continuing to do this blog. I look at it every day to get a laugh. You all are amazing. Please, keep it up. been a fan for almost four years - i come here daily for amazement, a laugh, and the pleasure of reading the comments from around the internets. thanks to you and your cohort! May 20, 2013 | Jen F.
Many congrats and _thanks_ for the five years of Cake Wrecks! I just can't get through the day without my morning Wreck! I cannot even imaging getting through a week, nay... a day without Cakewrecks. Love you all! Happy Anniversary! Thanks for all the laughs, snorts, & giggles. Also, thank you for teaching me to never, ever eat or drink while using the computer! Happy Anniversary! Here's to many more — can't wait to see what kind of anniversary cake you guys celebrate with! Congratulations on five years. And thank you for sticking around for us loyal readers. We would miss you if you were gone. Congradulations (see, works in print, too :o) to 5 years of entertaining us!! The one and only blog I just 'have to' check every morning!! Thank you for your hard work and dedication! I always know that if I need a laugh, I can always find one here. Here's to many more years of hilarity and good times! I remember driving to work when a caller into the local radio morning show asked the DJ's "Have you everseen the website that has reeaaallly bad cakes?" I googled "bad cakes" or something to that effect. Three years later, and here I am, making sure I check everyday for a daily dose of humot. Thank you Jen, John (thoJ), Lindsey, Sharyn, and anyone else who has helped along this journey. Thanks also to mindy1, Haiku Joy, Fluffy Cow, and dozens of other regular commenters that have plenty of times made me snort or sputter, causing my husband to look at me and say "What?!" So I don't remember cake #9, but all I could think of was "Make sure to call your doctor if your Oreo cake lasts longer than 4 hours." Happy bein' around for 5 years! I think I've been reading you from almost the beginning. Thanks for all of your hard work, even the thankless stuff! Happy Birthday, Cake Wrecks! Congratulations, Jen, John, Lindsey and Sharyn! You are a little happy part of most of my days and I'm very thankful for that! Comgramulasions four being around longer than expectant! In all seriousness, thank you for all your hard work! You have no idea how happy it makes me to wake up every morning and have a laugh before I start my day. Congratulations, and wishes for the wreckers to keep on a-wrecking, and you to keep on a-posting and a-snarking! OOOH I left a comment wreck. It's not the wrecks. It's your insane sense of humor, Jen. I've laughed to tears I don't know how many times. I even almost had disciplinary action at work for the memorable scared grasshopper post. Often I wonder "how in the world did she think of that?!" For all that matters, you could write a blog about toothpaste and I'd come to read it. Happy Anniversary! Let's see, I think I found you two years in, so I've only been following the blog 3 years? On the one hand, it doesn't seem that long, on the other, I don't remember not checking cakewrecks in the morning. Thanks for becoming part of my morning routine! Thank you for being part of my morning routine and making me laugh every day! Congratulations on 5 years! I honestly don't remember when I first found Cake Wrecks but it's first stop of the day now. And I feel like I *know* you because I've been to a book signing and have both of your books proudly on my shelf! Kongradjewlashuns on 5 years! This blog is my go-to blog for fun and hilarity (second being Epbot!). Thank you for making me laugh always. "Contragulations!" Thanks for the good job you, John, Lindsey and Sharyn do. It's gotta be hard being "on" every day, but you all do it in spades. And you all seem like such genuinely cool, nice people. We need more humans like you guys on the earth. So, once again, congradu, um, congraju, um, kengradulashio...CHEERS! Happy CW Anniversary, Jen and John! Thanks for making me laugh on a daily basis, and for being such fun, nice people. Thank you!!!!! Congrats on youre 5 yaers! Cake Wrecks makes me laugh, except on Sundays on a daily basis. I love seeing what you come up with. I have passed it on the many a friends also. Keep up the great work of making people laugh on a daily basis. Congratulations! I only found you relatively recently, and truly, now I can't get through a workday without you. Thank you! Happy Anniversary, congratuations, and THANK YOU! (it has to be in caps because its from the bottom of my heart). Your blog puts a smile on my face and, (because I am stoopid) coffee on my keyboard; at least it stays cleaner that way. This (and Epbot) is also the only comments section I read (except on Mardi Gras), and it gives me back my faith in humanity- so thank you everyone who's a part of wreckieworld. And how did I miss "4 hour fearless leader"? hysterical! A-HA!!!! I found the SECRET of your SUCCESS @ the bottom of today's post! :-) "...and to Sharyn, who helps me write to the wrecks..."
Wreckie Happiversary! Congradulamagations! I echo all the loyal Wreckies - we love you and WE WILL NEVER LET YOU LEAVE. But mostly we just love you. I came about 3.5 years ago, and caught up on the previous year and 1/2 in about a week. Been obsessed ever since. Love You! Love You! Love You! Thanks For All The Fish! I too don't remember how I found your blog, but I'm glad I did. Your books are too funny, even the 13 year old pours over them ! Thank you from Alaska. I honestly don't remember when I found you, but I am so glad I did! Some time ago I left Facebook and Twitter, saying I had a real life and needed to get back to it (which is true). However my morning routine is still: check my email, check CakeWrecks, read the paper. Some things are important. Good Luck in China is how I found you. My friend Jen L-G shared the China cake with us and I was HOOKED! My daughter & I trekked to your book signing at the Tattered Cover, she brought you a "My lap is on Fyer!" cake. She still wears her carrot jockey necklace with pride. Happy 5 years! We love you! Thank you for your warped sense of humour and sharing it with us. Keep on wrecking! May 20, 2013 | Jill M.
Thank you, thank you SO much! Oh, and the Sunday Sweets??? My six year old cannot go a Sunday without looking at them, she says "They inspire me!" and "I wanna do that when I HAVE to get a job, 'cause it's not really a job Mom, it's like playing with food all day!" CONGRATS!! !